As I mentioned yesterday, we’ve been away. We’re back now and today we have the last of the ‘Archive’ pictures that I’ve been subjecting you to, to make it easier to keep the postings coming while we were out and about. On 7th. October last year, I set myself the task of posting every day for a year. It hasn’t been easy to find a nice picture everyday for you. Still we’ve struggled through this far and I didn’t want to spoil our record just because we weren’t here. So I scoured the thousands of pictures that litter my computer and found a few that I thought would be easy to write about in an odd minute of peace and quiet. I then uploaded them to my Library ready to be clicked on when the need arose. As the year of a-post-a-day draws to a close, I’m feeling quite sad about it in a way but as I mentioned in the post last year – time moves on and I’ve lots of other things needing my attention – and I’ll talk to you about them over the next few weeks. Oh yes, the picture. 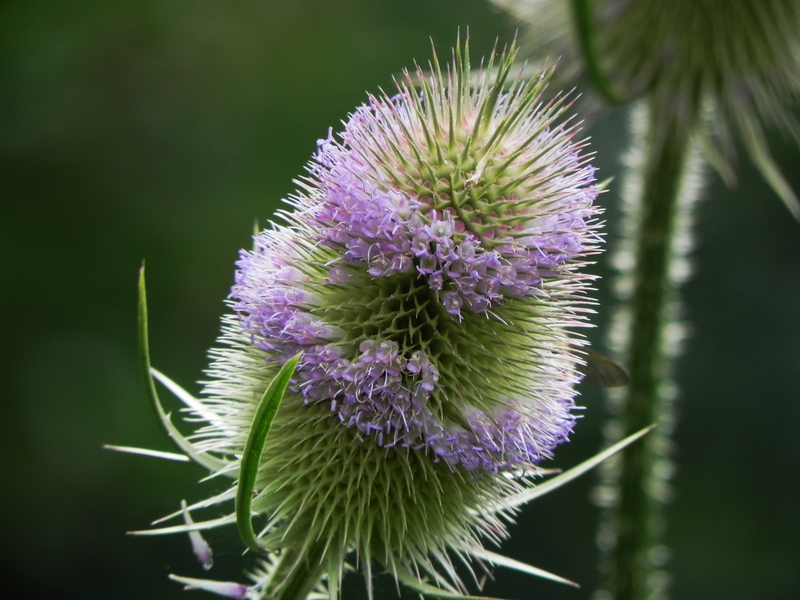 It’s a Teasel or a Teasle or a Teazel, suit yourself. Its name comes from the use of its spiny flower head in woollen cloth making, as a brush to tease or raise the nap of the cloth. Its lower leaves clasp the stalk tightly and dew and rainwater collect there – and for which the plant collected the name Venus’ Basin. Someone thought of dropping dead insects into these basins and found that there was an increase in the seeds in the flower heads of the plants involved. People do strange things, don’t they? Thanks Ange – I’ll be cutting back in October – thank goodness. Decisions Can We Bring the Children?